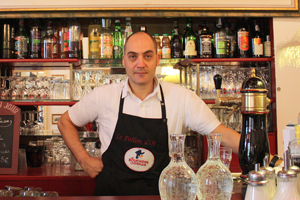 When you eat at Le Poêlon d’Or you will be greeted and fed by Yann Lalle, a fan of Lyon cuisine who is sure give your taste buds a treat!!! YL : I wanted to find a recipe that would give tourists what they were looking for – typical, inexpensive, quality food. YL : Amongst others we serve quenelles, veal sweet-breads, liver ‘cake’, kidneys, artichoke with foie gras and salade lyonnaise. YL : I’d choose chitterling sausage (andouillette) and quenelles. YL : It’s part of Lyon’s heritage in general. It’s traditional, typical, generous and inexpensive. YL : Bouchons should represent the history of Lyon. YL : They must be able to please their clients with their welcome and expertise. a typical Lyon dish : quenelles. a typical Lyon dessert : rum baba.